In this article, we are going to take a look at changing which objects get synced to Office 365 through organizational unit (OU) filtering. By default, Azure AD Connect is configured to sync all objects in all OUs. Filtering allows us to exclude OUs, and the objects they contain, so they are not synchronized to Office 365. An example of this may be to exclude an OU that contains service accounts for on-premises applications. In our example, we are going to narrow our sync scope to just a few select organizational units in the domain skaro.local. We will be working with the latest version of Azure AD Connect and a single forest environment. UPDATE 08/04/18: While these steps do still work, Microsoft recommends changing your OUs by rerunning the Azure AD Connect wizard. This can be done by double-clicking the Azure AD Connect icon. If the wizard does not work, you can use these steps as a fallback method. First, log onto the server where you have Azure AD Connect installed and open the Synchronization Service program. This opens the Synchronization Service Manager. From here select the Connectors tab. Under the Connectors section double-click the name of your local Active Directory. In my example, this is SKARO.LOCAL. This will bring up the Properties screen for that connector. From the Properties screen select Configure Directory Partitions. Then select the Containers button. This will launch a screen requesting credentials. The credentials you enter here do not necessarily need to be admin credentials. Azure AD Connect just needs an account that can read Active Directory. Once the credentials are entered click Ok. 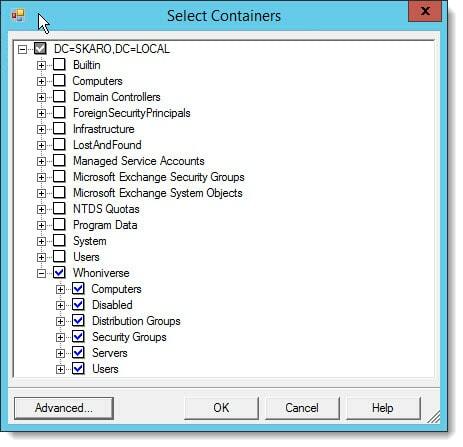 This will bring up the Select Containers screen where you can pick which organizational units you want to include or exclude. In our example, we are going to uncheck everything except ‘Whoniverse’ and its child OUs. This means that only objects under those checked OUs will be synchronized to Azure AD. Anything under an unchecked OU will be removed from Azure AD. Click Ok twice. Keep in mind that if you previously synced an object to Azure AD and that object is now contained in an excluded OU that object will be deleted from Azure AD during the next synchronization. All data associated with that object, such as a mailbox or OneDrive storage will be deleted. The good news is that the data is soft deleted. You can recover this accidentally deleted object (and its data) by either including that organizational unit back into the sync, or, by moving that object into an organizational unit that is still included in the synchronization. Note: Soft deleted data does have an expiration date and when reached that data is permanently deleted. For these changes to take effect we need to perform a full synchronization. The easiest way to accomplish this is to open PowerShell on the server with Azure AD Connect installed and run the following command. While the policy type of “Initial” does sound like it might wipe and replace everything in Azure AD be assured that it does not. Initial just means a full synchronization. Note: A full sync will take considerably longer than a delta sync. For organizations with tens of thousands of objects, this may take several hours to complete. It is worth noting that while a full sync is taking place, delta syncs cannot occur. Any changes made to local AD during the full sync will have to wait till the full sync completes and a new sync is initiated. We can monitor the progress of the full sync through the Operations tab in the Synchronization Service Manager. For a single forest environment, you should see 6 rows for the full synchronization all marked with success. You can select each row to examine more detailed reports about what is being added or removed from Azure AD. After the full sync completes only objects contained in included OUs will appear in Office 365. All other objects will be removed. With the full sync complete, delta syncs will automatically resume based on their configured schedule. If you need to make any changes to the OU selections you will need to repeat the steps above and rerun another full sync. Note: Azure AD Connect also has a built-in feature to prevent accidental mass deletions. By default, the synchronization service will stop if it sees more than 500 deletes in one sync cycle. What customization have you made to Azure AD Connect? Drop a comment below or come join the conversation on Twitter @SuperTekBoy.